Want to start to see hope in this world again? Team S.H.I.N.E. is excited to introduce our 2019 S.H.I.N.E. AMBASSADORS Scholarship recipients, Sawyer Garrity and Andrea Pena, co-founders of the non profit ShineMSD. They turned the tragedy at their school, Marjory Stoneham Douglas in Parkland, Florida on February 14, 2018 into something positive with their Camp Shine – a camp offered to anyone in need of healing through the arts. Team S.H.I.NE. is proud to support their futures as they are the epitome of young innovative leaders making a difference. The video below provides a glimpse into the camp. Andrea Peña is a junior at Marjory Stoneman Douglas. She is in her third year in the drama program and in her second year as Treasurer of Troupe 4879. Andrea is proud to be a part of Shine and looks forward to being able to give back to her community. She loves hanging out with her friends in drama who are practically her second family and loves expressing herself through art forms such as singing, acting and dancing. 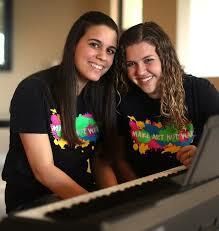 Andrea has been singing ever since she can remember and has been playing piano ever since kindergarten. She hopes that she can connect with others and bring people together through the powerful and universal language of art and music. Sawyer, 17, is a student at Marjory Stoneman Douglas, and a proud member of Troupe 4879. She has been with the drama program for two years and loves everyone who is a part of it. Along with MSD drama she has been a part of various outside theater companies such as, Barclay Performing Arts and Broadway Bound. She has been attended French Woods Festival Of The Performing arts since she was 8 years old. Theater has always been a strong constant in her life. Sawyer found her voice with music at a young age and has been deeply connected to it ever since. She uses music to help cope with her problems in the world, it is her outlet when she needs to express anything at all. While writing Shine with her close friend, Andrea Pena, Sawyer realized the full power that music has on people, and it’s healing properties. She hopes that with the ShineMSD Foundation, people from her community can find ways to express themselves through art and start the healing process. Sawyer wants to help her community come together to heal during these trying times. She also wants to make sure that the 17 angels we lost will be remembered forever. With the power of art- music, literature, dance- she hopes to start to accomplish these goals. Along with songwriting and singing Sawyer also enjoys reading books, spending time with friends, discussing Harry Potter, and spreading love and kindness to others. She truly believes that art has the power to transform us all. She wants everyone to remember to be kind to everyone they meet and treat others with love.